Breezer Tion O2 is a compact supply ventilation system. Its installation does not require renovation of the premises or air duct laying. 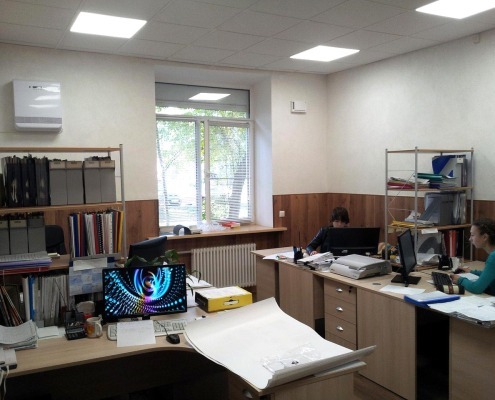 It is used as a solution for ventilation of minor premises, including living quarters and offices. The air supplied undergoes fine cleaning and is heated when necessary up to the set temperature (climate control function). The volume of air supplied from the outside depends on the pressure differential only. If exhaust ventilation is clogged or does not work, the valve will not work either. Low capacity. The supplied volume of air in most cases is sufficient for one person only. The volume of supplied air is limited by the device fan capacity only. The unit can be used in premises with poor exhaust ventilation. The air supplied is cleaned from coarse and medium contaminants (depending on the manufacturer and the device model), and in some cases when coal filter is installed, from hazardous outdoor gases as well. It is slightly cheaper than the compact supply ventilation systems. The air is cleaned from neither pathogens (viruses, bacteria, mold fungi) nor small-dispersed dust particles or plant pollen, while these types of contaminants are the ones to represent the highest threat for human health. No automation or electronic control. The price for the device frequently does not match the offered air cleaning quality. Air heating with climate control. 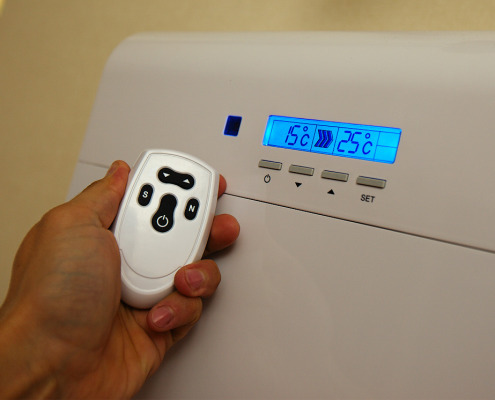 Energy demand is increased for the air heating mode. The price is slightly higher than that for ventilating units. In the operating mode with an open shutter (1), the air is supplied from the outside through the air intake port to the unit. The shutter protects the premise from cold air penetration when the unit is off. Then the air is pre-filtered from dust, fuzz, and allergens on the basic filter (2) ) of F5 class, and heated up to the temperature set by the user. 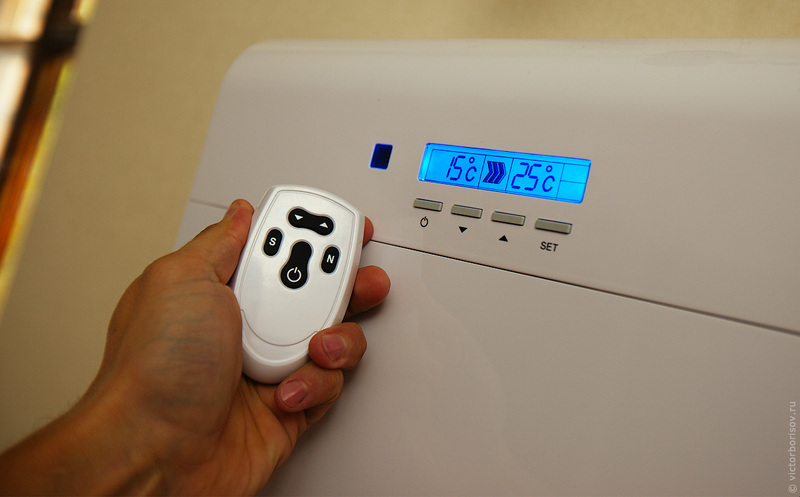 The heater has a climate control feature (3). 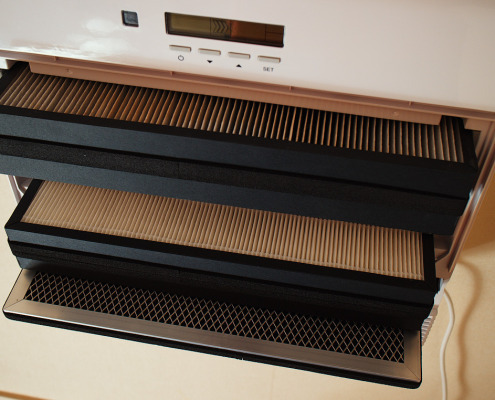 Then the air is decontaminated from microorganisms, mold spores, and fine particles while passing through a high-efficiency HEPA filter (4) of E11 (H11) class. At the last stage the air is cleaned on the adsorption-catalytic filter (5)from odours and harmful substances up to the average MPC level and supplied to the premise through the fan section (6) and the outlet bar. The control is provided by means of control buttons with LC interface. A remote controller (7)provides for comfortable use of the unit. 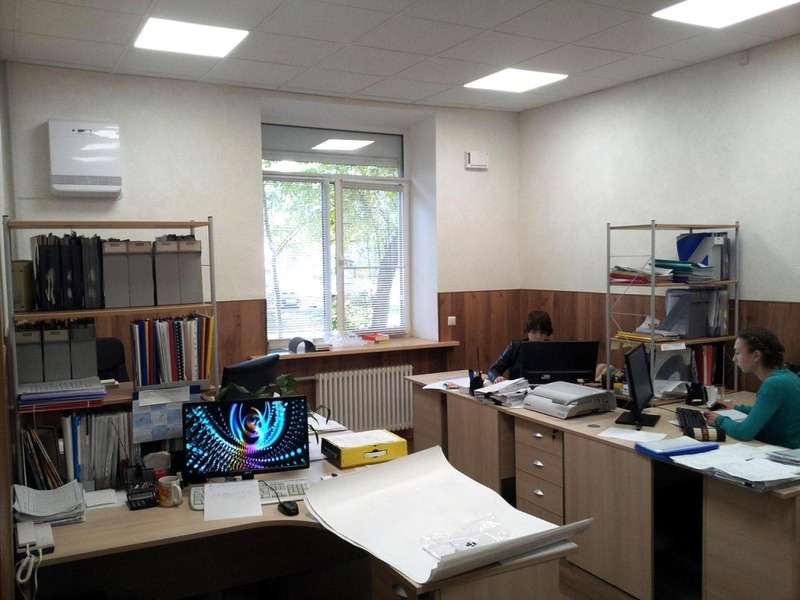 Usually one device is sufficient for a premise up to 25m2 or 30m3/h per person. 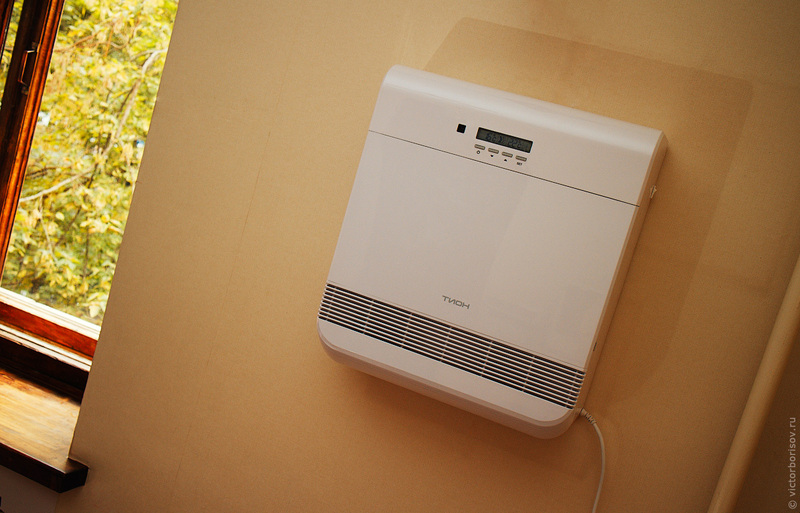 Breezer can be installed under a window sill, near a radiator or near a window where there is sufficient space for its installation (H 511 × W 451 × D 163 mm). The remote controller allows to sustain the device under the ceiling. An end-to-end channel 112 mm in diameter is produced in the wall. On one side it reaches the street, and on the side of the premise it meets a port in the device. 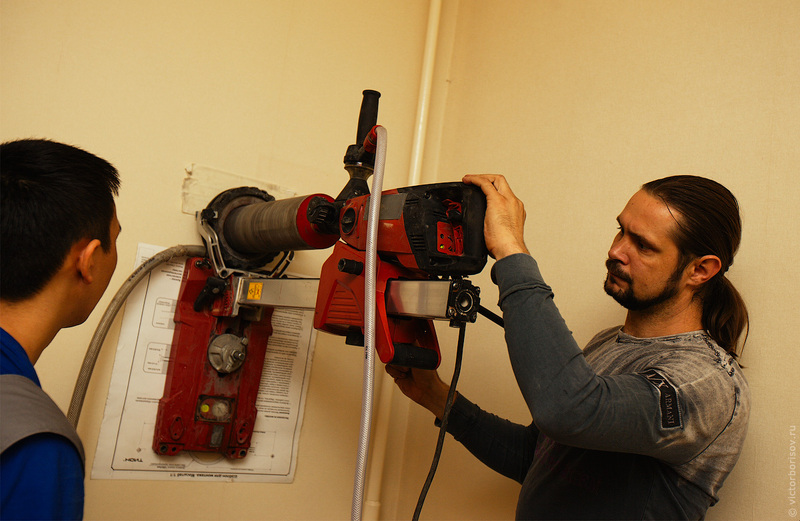 A diamond drilling device with a vacuum cleaner is used: not much dust will be produced during installation. Then the air intake channel is heat- and noise-insulated and closed by a decorative bar from the outside. 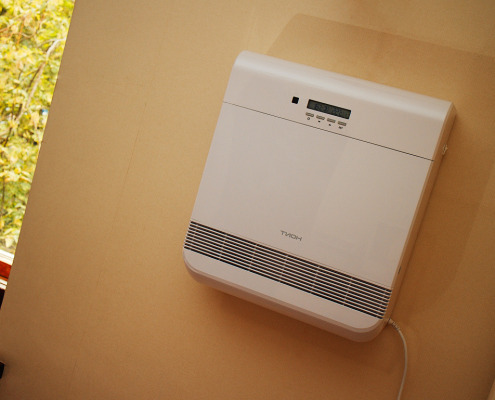 Tion O2 is fixed to the wall with the help of a mounting template and hardware delivered together with the device and is connected to the 220 V electrical socket. Important! When installation is completed please make sure it was done properly. The device must fit to the wall, and there must be no gaps between the backplate and the wall, which could let the air flow into the room. The basic F7 class filter entraps particles larger than 3 microns in size: coarse and medium dust, fuzz, coarse and medium plant pollen, fungi/mold spores, and bacteria. 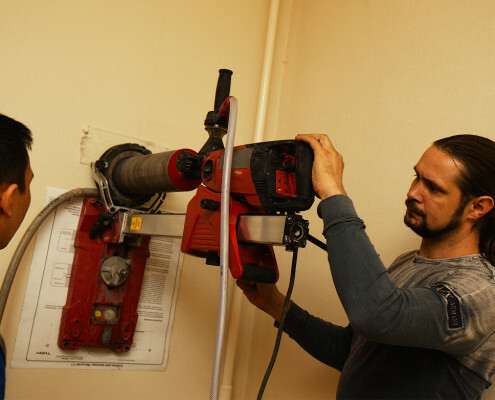 Frequency of replacement – once a year, given the regular vacuum cleaning. 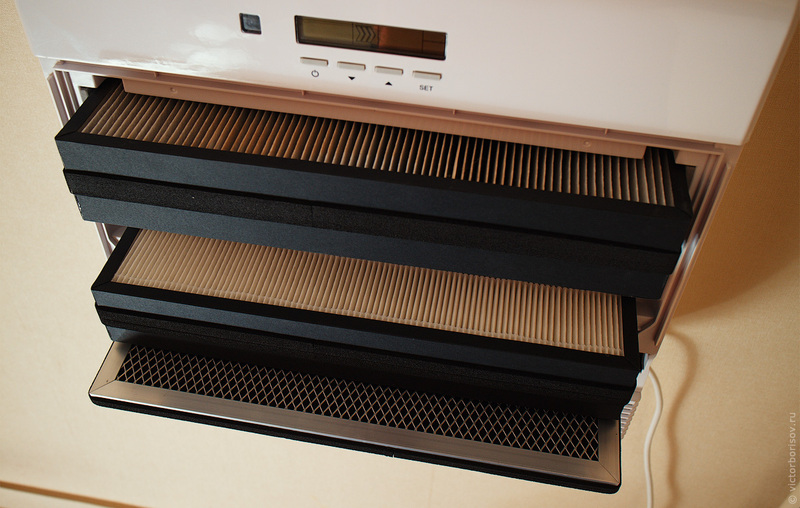 The HEPA-filter H11 entraps fine dust, allergens, bacteria, viruses, mold fungi with the effectiveness above 95% (MPPS effectiveness, %). Frequency of replacement – once in two years. The adsorption-catalytic filter of supply ventilation system Tion O2 cleans the air from the gases: outside exhaust gases, smoke, smog, and odours. Frequency of replacement – once a year. Adsorption-catalytic filter with increased capacity. Provides for fine air cleaning from the hazardous outdoor gases, volatiles, and offensive odours. Installed instead of HEPA filter in any Breezer. The compact supply ventilation system – Breezer Tion O2 – can be maintained unassisted. Depending on the device configuration, 3 filters need replacement once clogged: basic, high-efficiency, and adsorption-catalytic filter.